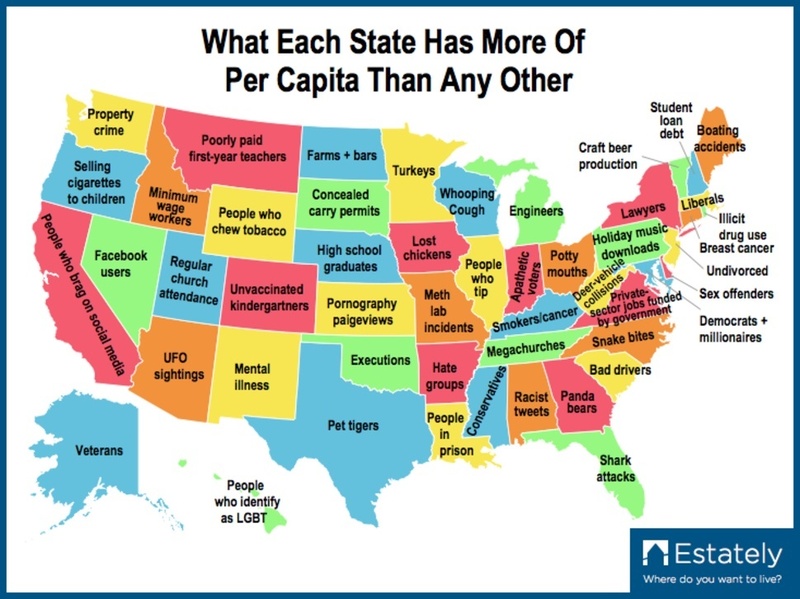 This entry was posted in Peculiar Science and tagged grouch, maps, musings, per capita statistics, pictures, science, thoughts. Bookmark the permalink. I thought pet tigers would be more likely for Louisiana. While traveling through Iowa, I did find a tourist brochure that said they had more golf courses per capita than any other state. Of course, they can only use them about half the year. Pet tigers would be more likely in Louisiana but they don’t permit the prisoners to have them. In Iowa, golf courses serve a secondary purpose of feeding chickens. I’ll take North Dakota, please. That’s my kind of state! Yes, better than turkeys or whooping cough. I’m from California and I totally agree with your map. Sickening. A relative moved from Pennsylvania to New Mexico. I told her that a NIH study confirmed that obsessive downloads of holiday music resulted in moving west and suffering mental illness. Funny. You don’t hear the words mental illness and holiday music in the same sentence very often.